For the more athletic, you could walk up in a couple of hours. The road winds through a shady gorge full of wild sage and thyme, along the river bed (dry in the summer). At various points there are fantastic views over Heraklion and the fertile land between the city and the mountains. 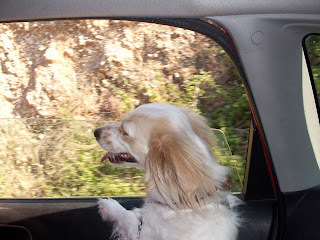 The drive up from the village of Kroussonas took us about half an hour, going at a fairly slow pace. Once or twice the road forks, but there are several signs for Vromonero so it is fairly easy to find. 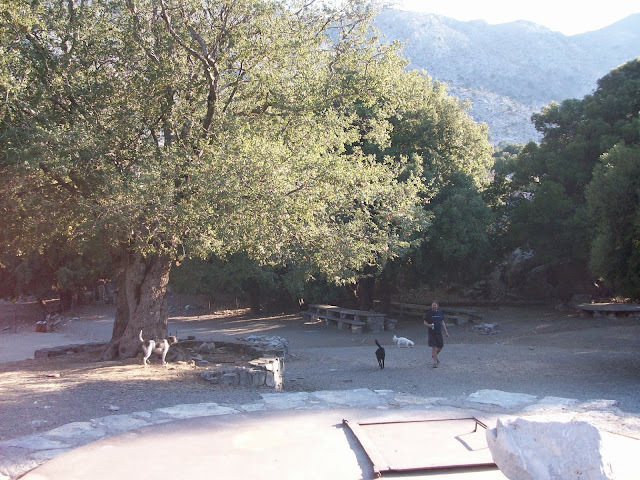 Once at the plateau you will find a couple of stone benches for picnics, stone circles used for fires and bbqs, the small church of Agios Giorgos, and not much else. 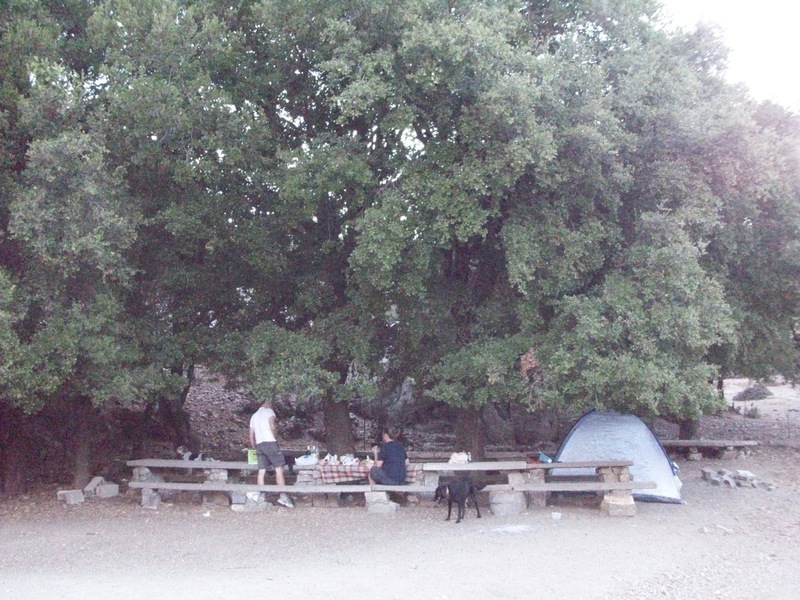 We pitched our tents under the beautiful holly oak trees that grow throughout this area. These trees are quite unusual in Crete. 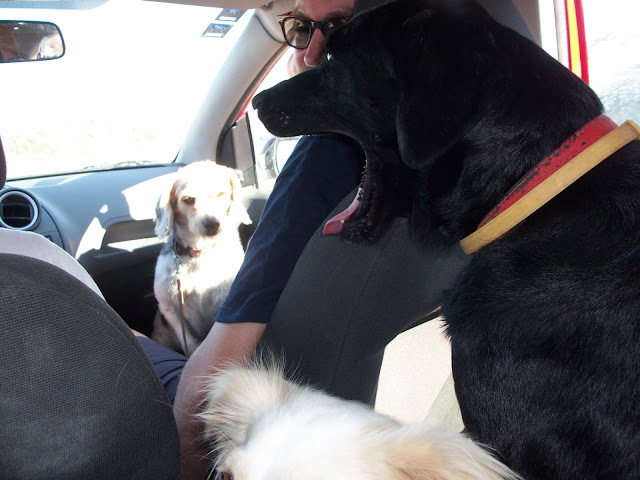 While we recovered from a hot and dusty drive with a beer, the girls ran around sniffing out the whole area and discovering endless stashes of bones to chew on. I gave up taking bones away from Sage because she just found another within seconds. By the time we got the bbq going, mainly using wood that we found lying around the plateau, the girls had calmed down and were happy to sit waiting for whatever treats might come their way from our meal. We had carried charcoal and food to bbq with us. At the site we found clean grills that you could use, but we had an organised camper with us who has a skillet for cooking on charcoal. This was a really good, relaxing trip - you know one of those where everything just works out? We found shade, we had food, fire, water, good company.... the dogs loved it too. There is not much to see or do at the plateau, except eat, drink and relax with friends. The small church there, Agios Giorgos, has an interesting story - it was dedicated by a chieftain from Kroussonas who, seeking refuge there from the Germans during the German Occupation, asked Saint George for help, and survived the attack. 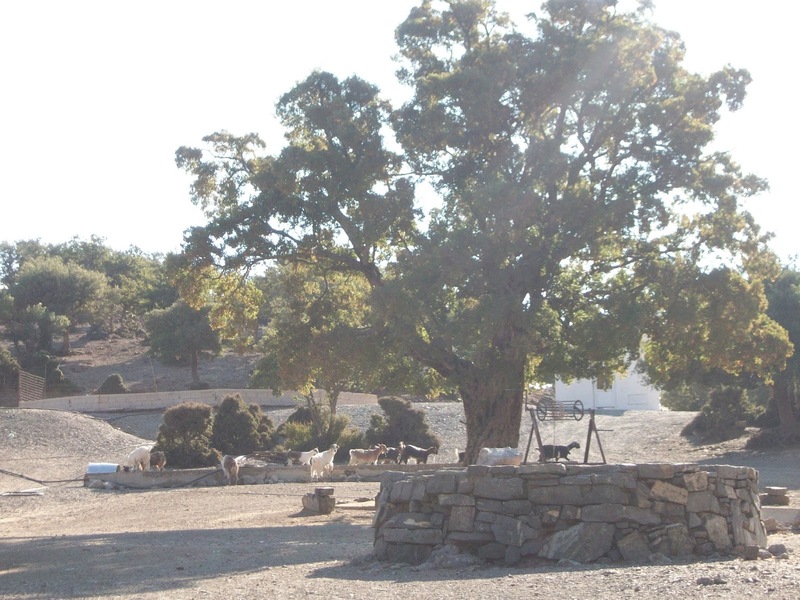 A word of warning - we woke early the next morning to find that local goatherds lead their flocks through the plateau to drink from the toughs up near the church. There was an almost constant stream of goats passing by for about an hour. The goatherds greeted us and were friendly, but we had to keep tight hold of our dogs for most of the morning. I really enjoyed this small glimpse of life up in the mountains, but it is something to bear in mind if you dog is a goat chaser.... and most seem to be. On our way back to Heraklion, we stopped in Kroussonas for a coffee. I can't really recommend the place we went to, except that they did allow us to sit with three dogs, and it was 'authentic', to say the least. The kafeneio doesn't have a name (it is by the Turkish fountain on Makis Kritis street (1 road up from the main road through the village). There was no loo. The waiter only came over after we'd waited for about 15 minutes and finally one of the locals yelled for them to come over. The coffee was nasty. There was nobody around to pay when it was time to leave, so we left a random amount of euros on the table and hoped for the best. The village is quite interesting though, having kept its rebellious nature through various occupations and on into present day - it's known for being a little outside of the law. There are some lovely old houses, the typical narrow streets that are terrifying to drive down, lots of bright flowers... it's worth a look, but I don't really recommend you stop for coffee. After leaving the village of Krousonas, follow signs for the Monastery of Saint Irini. You will start to ascend the gorge, and there you will find signs for Vromonero Plateau.